As I write this, it’s the run up to Christmas and I’ve reached the point where anything now left undone on my to-do list is going to stay that way. So I thought I’d change focus slightly from my normal fare of webpages and paper forms to think about magazines. and a top shelf with things that aren’t really suitable to mention on a well-mannered website like this one. 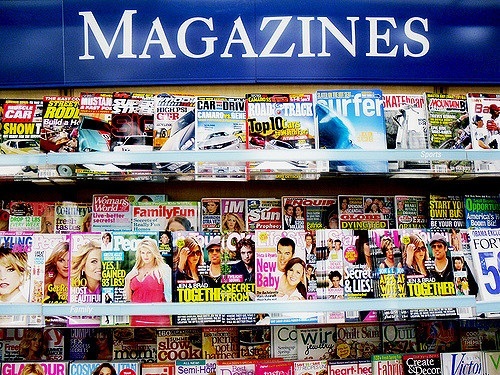 Today we’re on that middle shelf, which in these politically correct days are known as ‘lifestyle’ magazines – but let’s be honest and admit that the majority of the readership is female, as a flick through the content will demonstrate. If you don’t feel like venturing out to see one for yourself, then Good Housekeeping (my favourite) will give you a flavour. So what has that got to do with usability? Actually, Good Housekeeping has a long and honourable tradition of usability testing. They call it the ‘Good Housekeeping Institute’ and it’s been going since 1924. Sounds good to you? Well, thinking about how people behave, communicate and connect seems to be a major facet of usability to me, so I gladly slapped down £2.50 or whatever it was and settled down to read it during my next bit of travel. If you tore off the cover, you would have a somewhat down-market version of Good Housekeeping. More scandal and celebrities, worse recipes, and certainly no usability testing. I’d say that at least half the magazine makes no attempt at all to consider the psychology of anything, and the rest didn’t impress me. Maybe the first issue was misleading. Maybe, if I could read French better, I’d be inspired by the website of its parent magazine (but maybe not, as I do read enough French to have discovered that the content is about the same).